Right Sector nationalists encircled the Parliament building in Kyiv on Thursday demanding the immediate resignation and tribunal of Interior Minister Arsen Avakov who they hold responsible for the assassination of Aleksandr Muzychko. The Right Sector leader was killed earlier this week in Rivne in western Ukraine. The circumstances surrounding Muzychko’s death are in dispute. He was either killed during a shoot-out with police at a cafe or was abducted and executed. Right Sector vowed to retaliate after the incident. 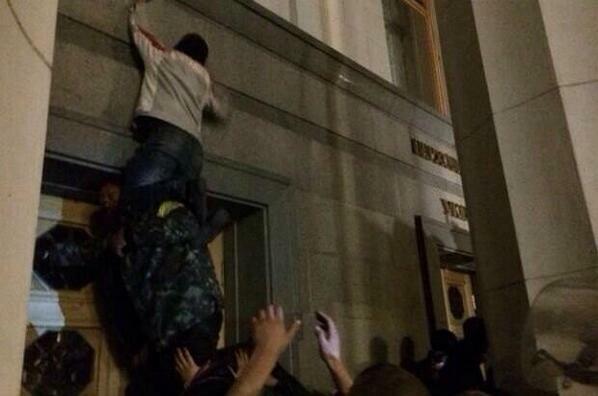 Around 2,000 members of the neofascist organization converged on the Verkhovna Rada Thursday evening and smashed glass door panes of the government building. The Russian state news agency RIA Novosti reported parliament MPs had escaped through an underground tunnel. Security forces prepared to disperse the demonstration with water cannons, according to the Russian news network RT. “We’ll wait for the negotiators from the Parliament, the MPs, but we won’t settle for Avakov’s resignation – we want his tribunal,” the activists said.